Back by popular demand, it’s a month of recipes inspired by musicals! I first did a musical month in July, when I wrote about meringues inspired by the show Wicked, and four other recipes from musicals that I love. I’ll be starting this month with one of the most beloved musicals ever. Did anyone else watch The Wizard of Oz every year at Christmas? That movie had it all – an orphan hero, a quest to return home, fantastic sidekicks and an over-the-top evil villain. No matter how many times I watched it, there was always something new. Thanks to Judy Garland’s lovely voice, Roy Bolger’s graceful dancing and Margaret Hamilton’s amazing portrayal of the Wicked Witch of the West, it really has stood the test of time. These dreamy lyrics inspired me to bake Lemon Drop Cookies. I love lemon desserts, and these cookies are one of my favourite new finds. If you bake them, your troubles truly will melt away. In a large bowl, combine sugar and lemon zest. Cream sugar mixture with butter. Beat in egg, lemon juice and vanilla. Stir in flour, salt, baking powder and baking soda. Add crushed lemon drops and stir until just combined. Chill dough in the refrigerator about 30 minutes. Place powdered sugar in a shallow bowl. Form cookies by rolling heaping teaspoonfuls of dough into balls and rolling in powdered sugar. Place cookies on a baking sheet lined with parchment paper. (Note: these cookies spread, so don’t crowd the cookie sheet.) Bake at 350 degrees for 9-10 minutes, or until edges are set and centres are just slightly soft. Allow cookies to cool on cookies sheets for about 3 minutes before transferring to a cooling rack. What an interesting cookie, Beth. Never have seen one made with lemon drops! What a fun idea!!! Love these cookies! What a tasty tribute to a beautiful song and movie! I will always love that film, and these cookies look delightful. I was so excited when I saw this in my blog reader…too cute! I just read the book for the first time this fall. Thank you for making me smile (and my stomach growl!) I hope you had a blessed Sunday and I wish you a warm and peaceful week. I love anything lemon..these look awesome! I so love that this series has made a return! The recipes that you shared during the first go round were so fun to read about. This cookie looks like such a nice contrast to the heavy, chocolate dipped things we get bombarded with during the holidays. Great suggestion! Watched it every year. Even in college, we'd all watch it, and do all the dialog, so much fun! The cookies look amazing. I just pinned this recipe to try soon. I can tell just by the look of them that I'd love them. They look thin enough to be slightly crunchy with a chewy center. Am I close? Add the lemon and I am happily planning to try them. Thanks! First of all, hooray for musical-inspired recipes! And, Oh. My. GOSH!! There are real lemon drops in the cookies! Lemondrops were my favorite candy for the longest time after we sang Somewhere Over the Rainbow in choir in elementary school. Lemon Drop Cookies passed me by in that song too but I'll make amends. All my hubby's troubles will fade away and they'll be "no place like home" when I bake these cookies. He loves all things lemony. "Somewhere Over the Rainbow" is one of my favorites. 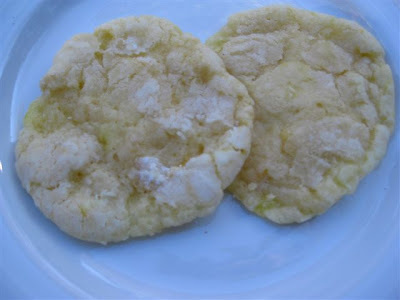 Your lemon drop cookies look fabulous and I can imagine how wonderful they must be with a good cup of tea! these are so good, and that's coming from someone who shies away from lemon desserts. great cookies inspired by a great movie! Mmmmmm….these must have an intense lemon flavor!!! I'd love if you'd link these up to the cookie blog hop on my site. Have a great week, Beth! Lemon drop candy in cookies…I love lemon and I love the idea too. For me, it's the Sound of Music that I love during Christmas and Easter. Now I have to make some crisp apple strudel! Ooooo you use lemon drops–PERFECT!!!! Did I watch it every year? You're kidding, right! I had it memorized. And then hosted Wizard of Oz parties for all the Wizard of Oz actor-geeks out there in NYC. We knew every line. So a bright, lemony cookie just brings it all back. I had such a crush on Ray Bolger and the Scarecrow ornament hangs proudly on the tree. Thank you for bring back that song and that musical. 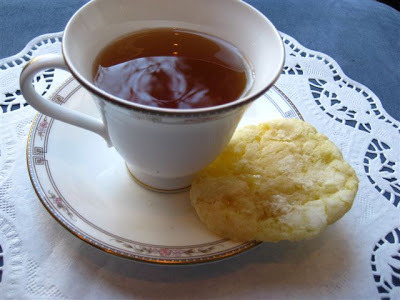 Now thes cookies are calling my name; I love lemon but have had lemon drops…perfect with my cuo of green tea. Yum! I'm going to show my husband your blog, Beth. He loves to bake. Oooh, I missed the last month of musical theme, I'll have to check it out! Love the idea! Love the cookies Beth and Wizard of Oz! I bet these cookies would make any troubles melt away. I love lemon cookies and these seem like the perfect one to add to my collection. 🙂 I also love the Wizard of Oz and Wicked! I sing Somewhere Over the Rainbow at least once a week as I cook dinner, off-key and belting it out, but at least i am enjoying myself. I really enjoy your musical inspired recipe posts. Yes, I remember watching the Wizard of Oz at Christmas time. That made it extra special because we would wait all year to see it. Your cookies sound delicious. I love all things lemon. I've been a fan of musicals since high school, so I can't wait to see what other recipes you post in this series! And, I'm a fan of lemon desserts. These cookies sound great. Count me in as one who used to watch the Wizard of Oz on a yearly basis. I always enjoyed the caution that "the first part of the movie is in black & white; once Dorthy gets to Oz, the movie is in color." Great cookie recipe. Lemon is one of my big favorites, too, so I always am on the search for more lemon recipes. And I'll bet the lemon drops add a nice crunch factor. Thanks for this. I love that these were inspired by by the Wizard of Oz! Lemon desserts are some of my favorite! I love lemony cookies..they really seem to melt in your mouth! These look amazing and I love where the inspiration came from. I haven't watched that movie in forever! How neat that these cookies have actual lemon drops in them! I love lemon and I love the Wizard of Oz too! What a fun cookie with the lemon drop candies in it! YUM! Your cookies look great! I love lemon drops! Beth, they do look light enough to float with the clouds. Beautiful. If you have a moment, would you link them up to Bake With Bizzy. It is the second or third post. I love any kind of lemony dessert or sweet treat, possibly even more than chocolate, so I can't wait to give these a try. Thanks for dropping by my blog today – hopefully you'll visit again soon. I love lemon-everything & love that these cookies were inspired by 'somewhere over the rainbow' – an all-time favorite.